Tell us about THE GREASY HANDS PREACHERS? 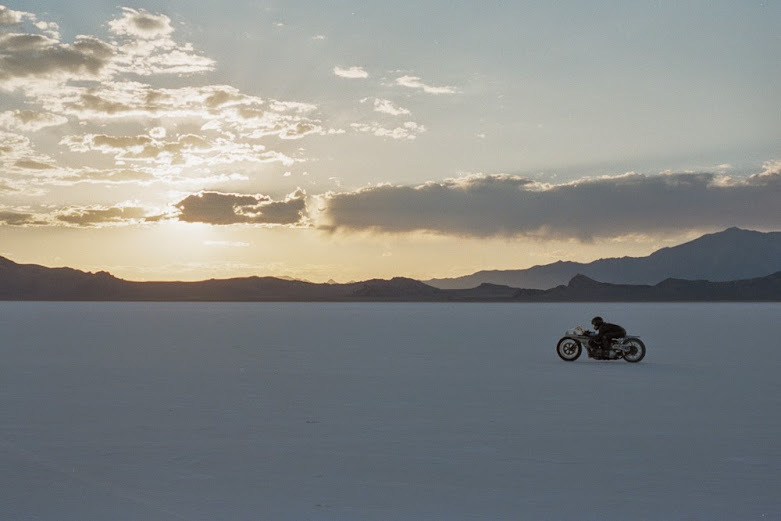 In the Summer and Fall of 2013 I tagged along with “The Greasy Hands Preachers”, a french-made documentary film by Clement Beauvais and Arthur de Kersauson, that travelled through the US and Europe, exploring the revival of mechanical work through the lives of 5 custom motorcycle builders. For the most part these guys had turned in their white collar jobs and masters degrees to return to working with their hands, each one now combining artistry and mechanics in their own unique way. Over four months I shot 35mm stills alongside the cinematographer’s Super 16, working in both color and black and white negatives. I felt incredibly honored to be on the road and shooting these guys, many of which are very well known within the motorcycle community, but had never been approached and photographed on such a personal level. 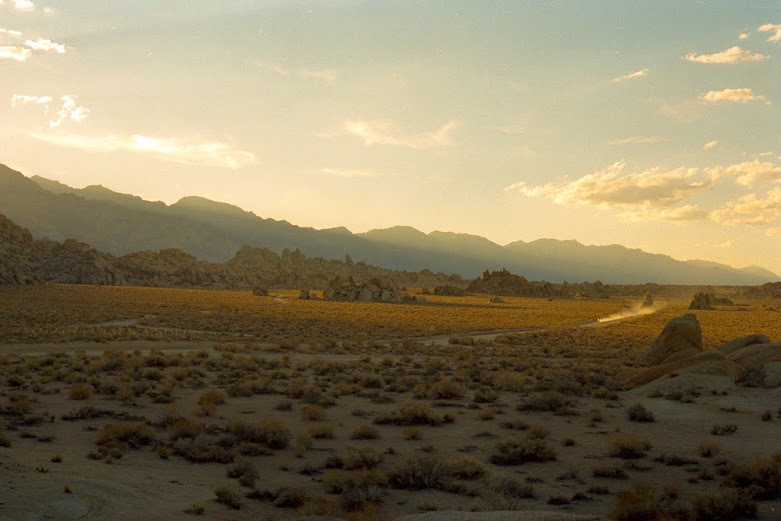 I’ve picked out a few shots from the journey that stand out to me within the spirit of the film. Shinya Kimura. The first protagonist we followed, who we first caught out at the Bonneville Salt Flats in Utah participating in Speed Week 2013. 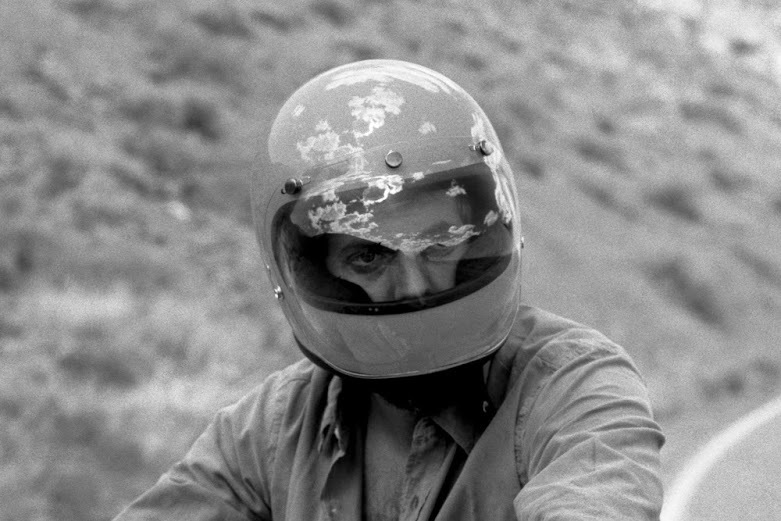 The man is a legend within the motorcycle community, a quiet master with an uncompromising dedication to his craft. At first our approach had an almost nature-documentary feel, as we kept our distance as if we were capturing something wild in its natural habitat. Over the week we got closer, and on one occasion piled into the back of his support van that chased him down across the salt flats during a speed trial. One of my favorite photographs comes from right after this moment, which focuses on a small piece of paper over Shinya’s shoulder. What looks like a receipt is the official printout of the top speed of his run moments before. Its reads 121 mph, marking a new record for him. 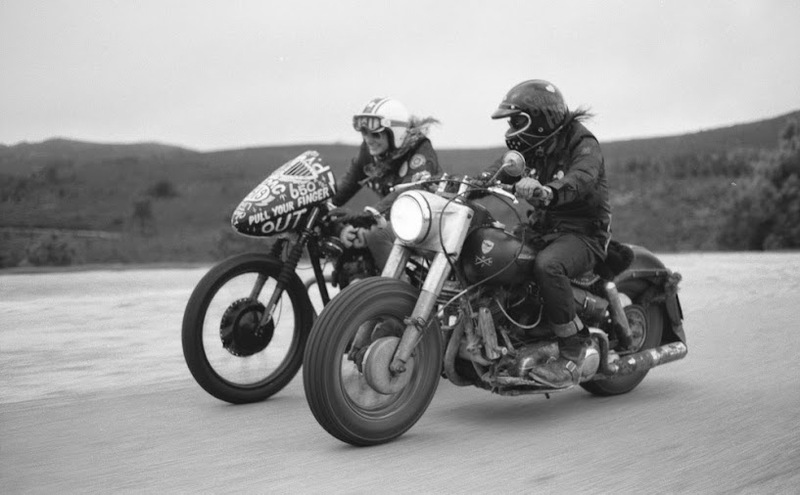 After the United States we headed to Scotland with Blitz Motorcycles out of Paris, France. 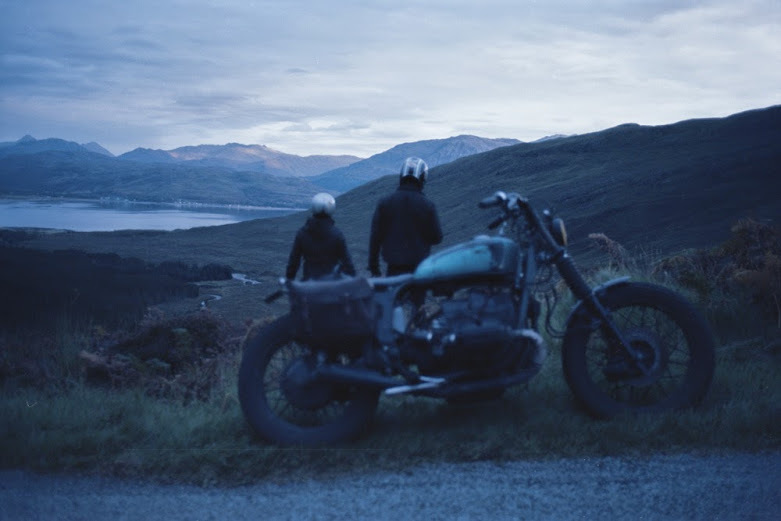 We took a week shooting the guys on their BMWs as they meandered through the Highlands, touching on the theme that form and function aside, the motorcycle is meant for travel. My personal favorite shot from Scotland, we had just crossed over onto the Isle of Skye from the mainland, on a small ferry that let us off on a one lane road that wound up into the hills. 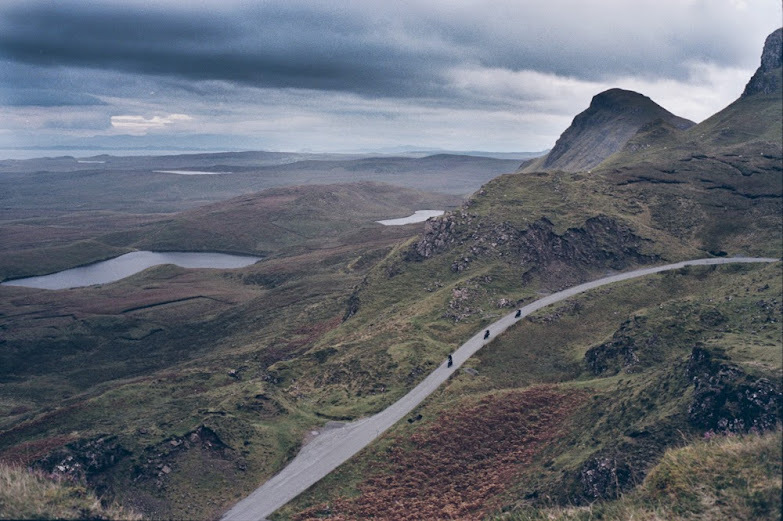 Though we originally planned to push further up into the Highlands, the beauty of Skye would end up keeping us on the island for the rest of the trip. 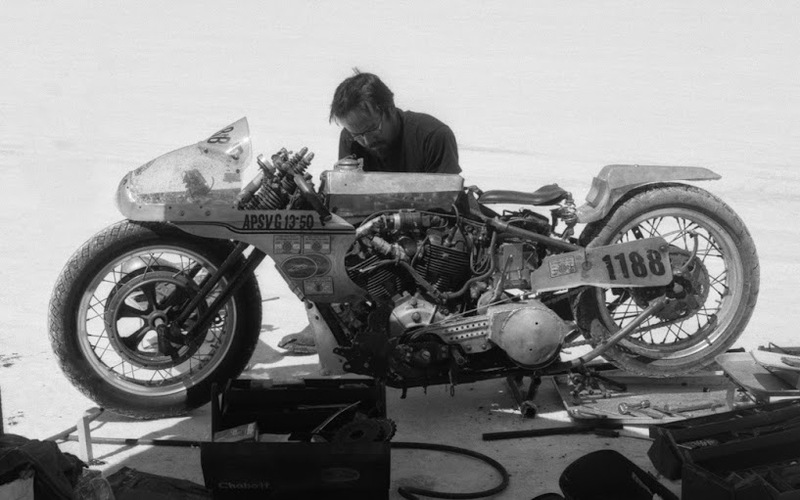 This one is from the documentary’s first day of shooting, out at a Hell On Wheels flat track racing event in Perris, CA. We had spent the day shooting on the track, and were settling in for the night in our RV when a few guys started spinning some donuts in the dust right outside the door. I snapped the last shots of a roll and was in such a hurry to load another that I opened up the camera without rewinding... but it was too late. Most of the shots were ruined instantly, except this one where the fogged bands on the left show where the stray light finally stopped. In California we took time shooting the film’s producer Arthur crossing some landscapes on a borrowed Deus Ex Machina bike. We caught some spectacular moments in the EasternSierras, this one in the shadow of Mount Whitney in the Alabama hills. I feel there’s really something about the image of a lone biker crossing a beautiful horizon that seems to capture motorcycling at its core. 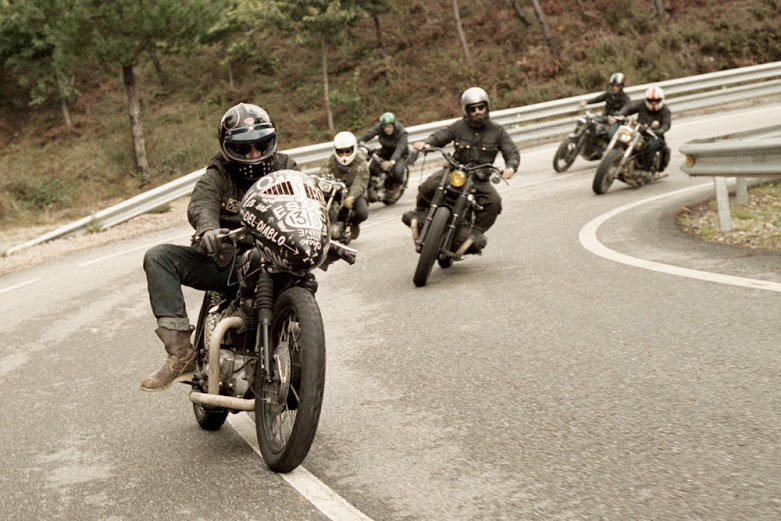 The final and wildest segment of filming was in Spain with El Solitario MC, a motorcycle collective based in Galicia. 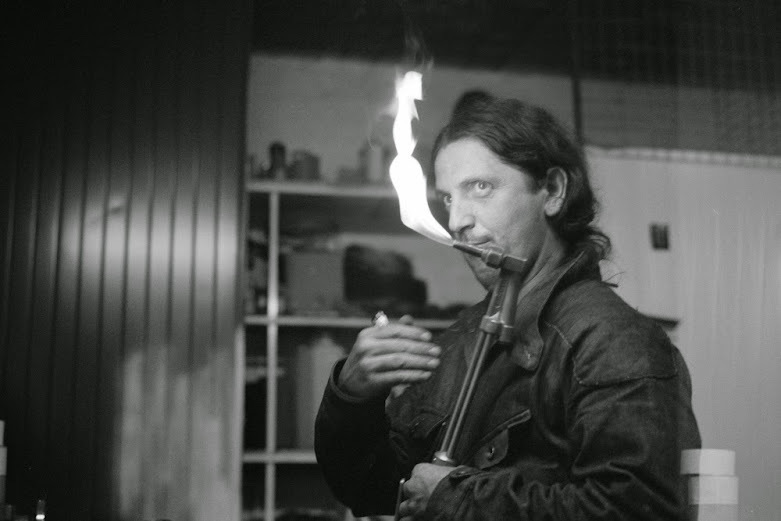 We began with a very psychedelic sequence in the Bardenas Desert, and then spent a week at his garage and residence in a very rainy and far-flung corner of Spain. 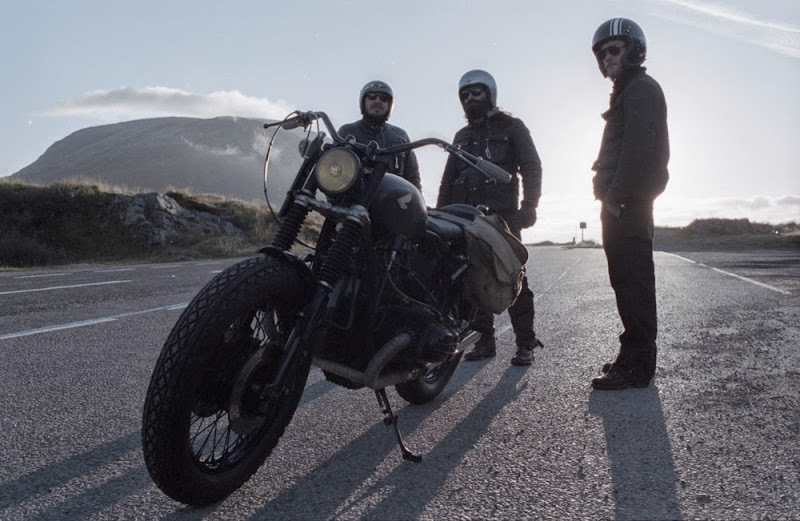 The shoot ended with a group ride through the hills above the Portuguese border joined by family, friends, and some of the earlier protagonists of the film. Though spread out across the world the community is surprisingly tight-knit, as if they’re all members of the same extended family. 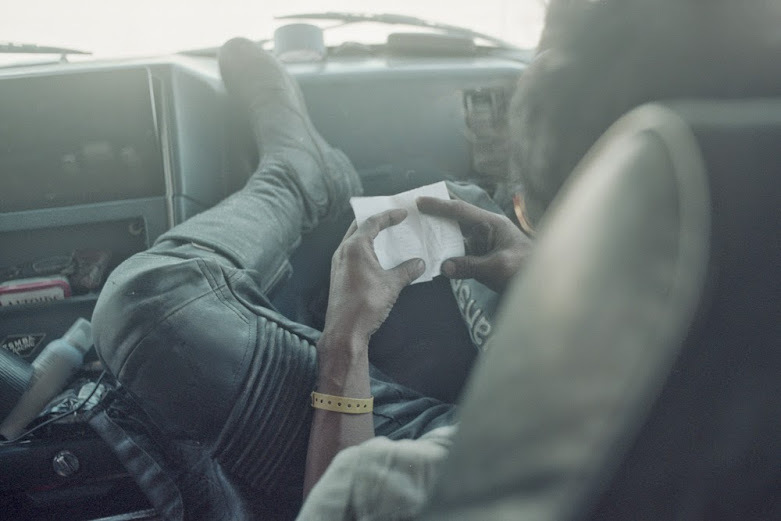 I caught the above moment of El Solitario and his wife Valeria whilst hanging out the back of a station wagon. The first thing I always notice in the photo is her smile. Motorbikes and mechanics aside, I think above all the film is about finding happiness in whatever passion in life you choose to pursue. What drew you to still photography as opposed to the moving image? Do you think there’s something more that a single image can offer that is possibly lost in motion picture? Its funny because originally I felt quite the opposite, and when I was just starting out I was adamantly studying all things cinematography. I had always taken pictures but never had considered it something legitimate for myself and kept it as a hobby. It wasn’t until after a few years of working as motion picture camera assistant that I felt drawn to it more heavily, perhaps because of the immediacy and simplicity of the still camera when compared to motion. For myself any spark I had was lost in the motion picture process, and it felt incredibly liberating to strip things down to their simplest form. 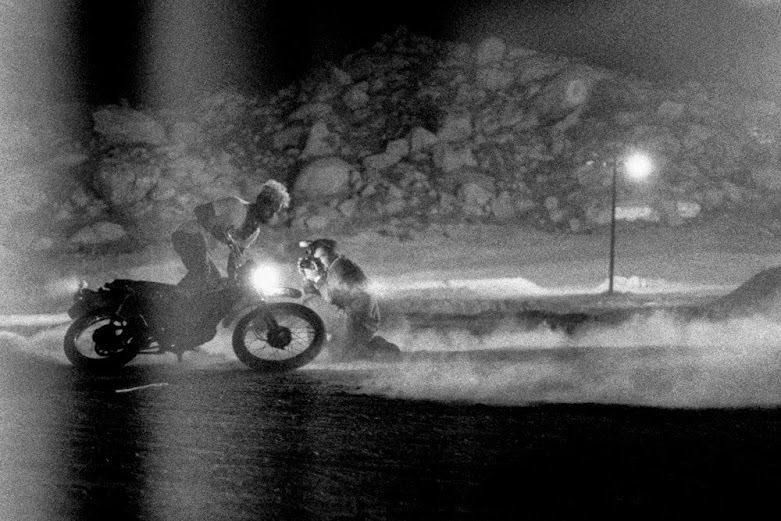 I don’t think a still image can offer more than a moving one, rather it offers a different experience, a condensed one. I feel a good photograph, a good documentary one in particular, not only freezes the instant of capture, but the feeling of the surrounding moments. While I don’t have a particular subject I favor, I enjoy shooting anything that is genuine and unfolding in front of me. This is why I prefer reportage shooting to a studio setting. Set photography fits into this category and I’ve been doing a good bit recently, but I would really love to get involved with another documentary project. What’s next? Where do you hope to explore more? Well at the moment with the Greasy Hands Preachers we’re preparing to do some exhibitions to take around closer to the release of the film. Otherwise I’ve been taking some time to work on some small personal projects, one in particular that looks into what I consider the increasingly bizarre relationships between people and technology, or instances where the future has sort’ve collapsed onto the present. At the other end of the spectrum I’m very interested in remote atlantic islands, though it’s a far off subject to say the least. I’ve always called Los Angeles home, but that may change soon. Its all up in the air, we’ll see what life brings!